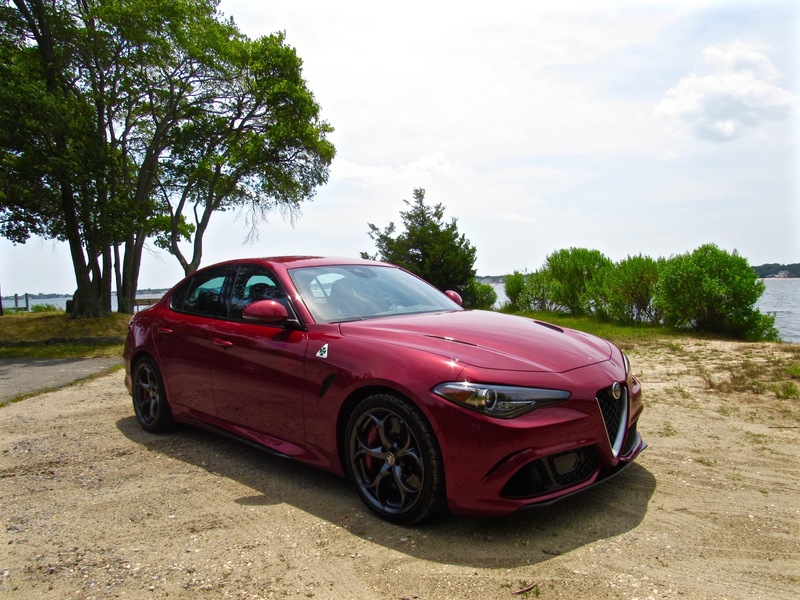 Many, many years ago, I was reading a Motor Trend magazine and stumbled upon an article that claimed Alfa Romeo would be making a return to the ‘States. The car was to be called the Giulietta and it was to be a fun looking, rear-wheel drive hatchback. I had never actually seen an Alfa Romeo in person before and I thought to myself, “I’m gonna get me one of those when they finally come out”. Well, years and years went by and nothing. 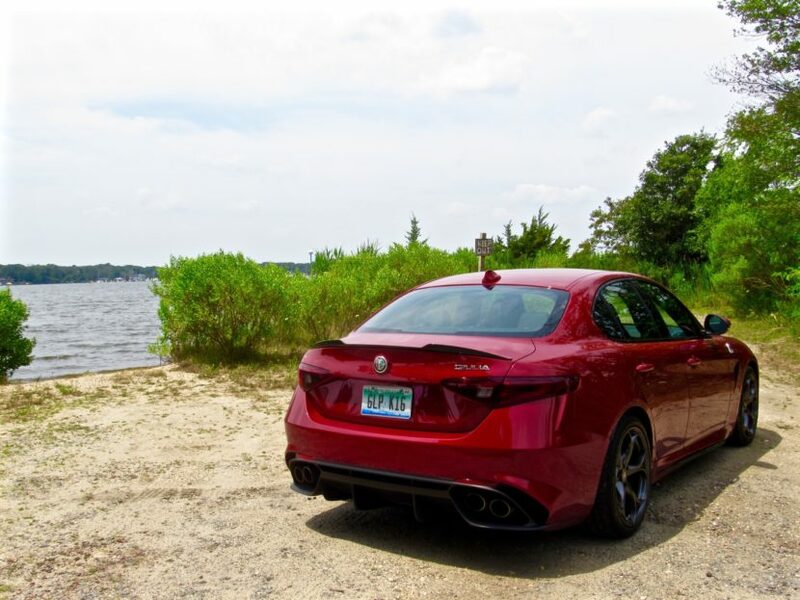 Alfa Romeo had seemingly betrayed me and the rest of the American enthusiast population who had been begging for a return of the famous Italian brand. Until now. 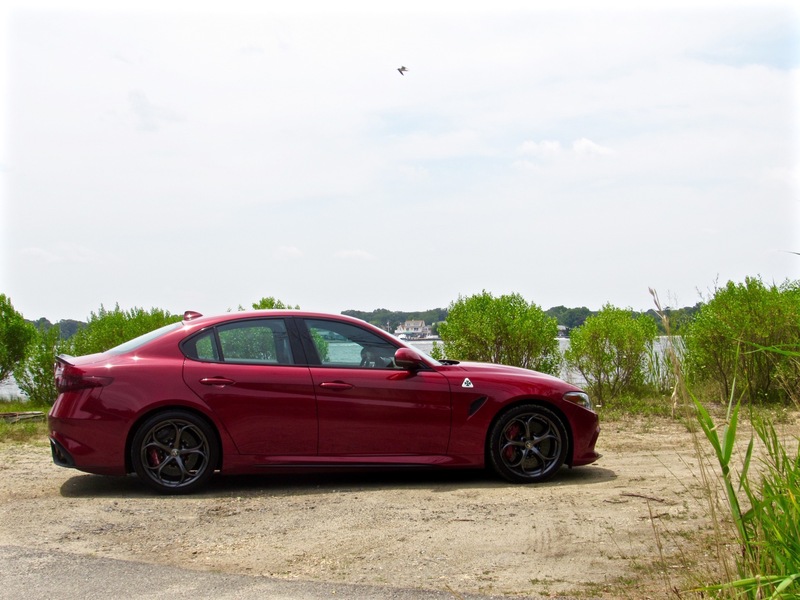 When the Rosso Competizione Alfa Romeo Giulia Quadrifoglio arrived at my door, a chill ran down my spine. “It’s finally here, at my door step and the key is mine for four days”, I thought to myself as I tried to hide my giddy excitement from the delivery man. “What’s up”, I said, trying to play it cool. But inside I wanted to jump around like a teenager after a first kiss. This was years and years of hoping and wishing I’d ever get to drive one and it was finally right in front of me and the man delivering it handed me the key and drove off. The Alfa and I were alone and I knew I could just get in and drive. There’s a very good reason why “never meet your heroes” is an expression. Often times, we hype up our heroes or our desires in our head so much that meeting them or fulfilling them can often be underwhelming, next to our sky-high expectations. 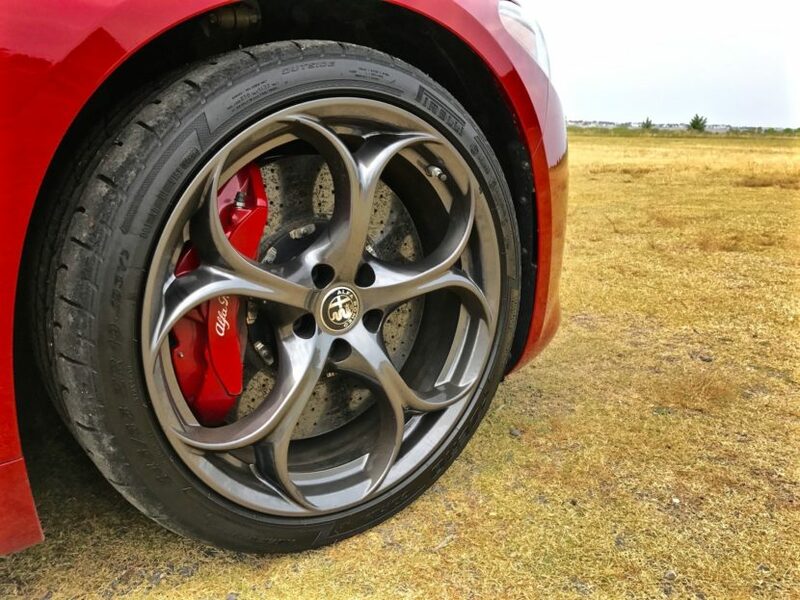 But just standing there, staring at the Giulia Quadrifoglio’s gorgeous curves, aggressive carbon fiber and stunning wheels. I knew I was already smitten and my hero wouldn’t disappoint. 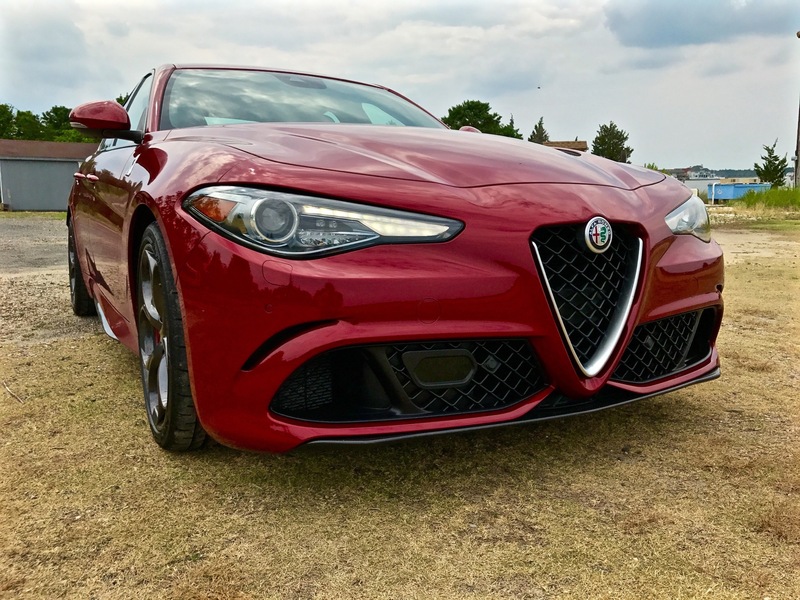 It is beautiful, the Giulia. Even in standard non-Quadrifoglio guise, it’s a gorgeous car. 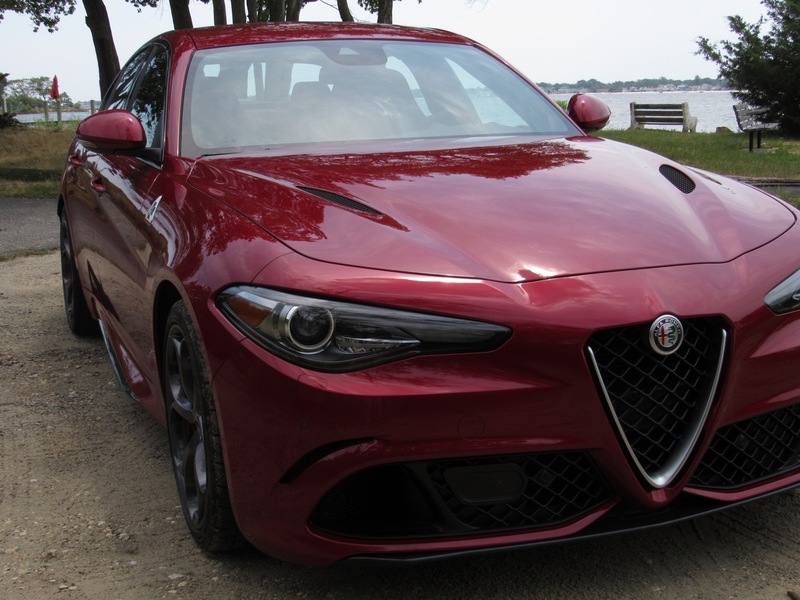 Its curves are voluptuous, its Rosso paint is so perfectly Italian and that classic Alfa grill flanked by two squinty headlights all combine to give it a soul, a passion that’s simply not found in any German car. Compared to the Alfa, the BMW M3 looks like a box with wheels. Compared to the Alfa, the Mercedes-AMG C63 S looks like a jelly bean with “V8” badges. And compared to the Alfa, Audi’s are barely noticeable. It’s stunning and intoxicating. And that’s before you even open the door. 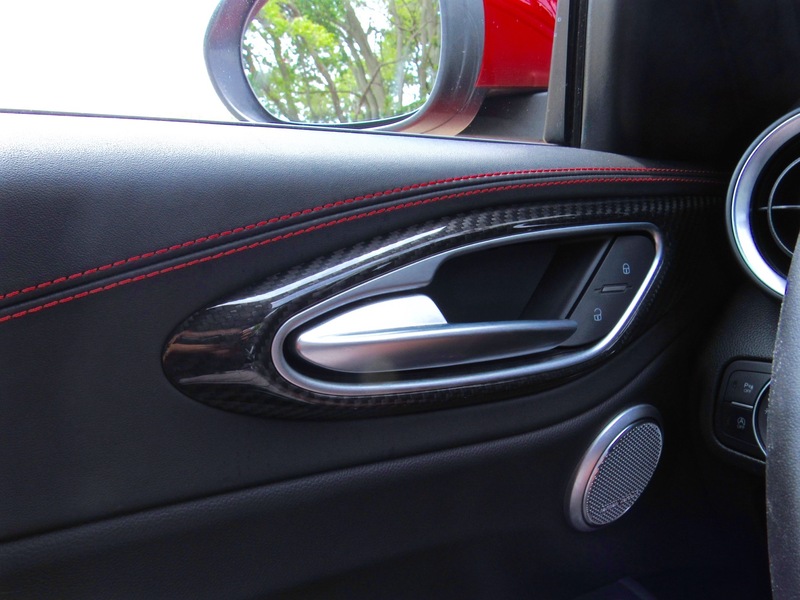 Open the door and you’re greeted with an interior befitting an exotic supercar. 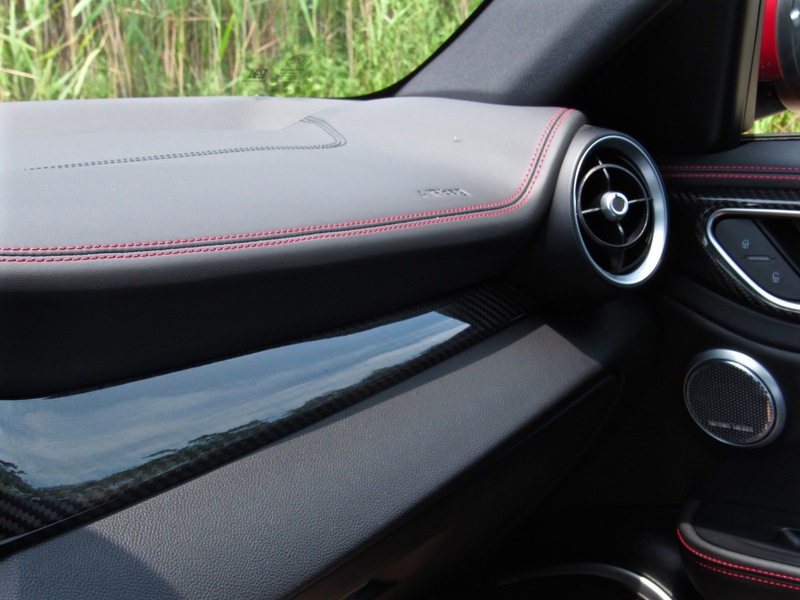 Everything is covered in leather and Alcantara with contrast red stitching. 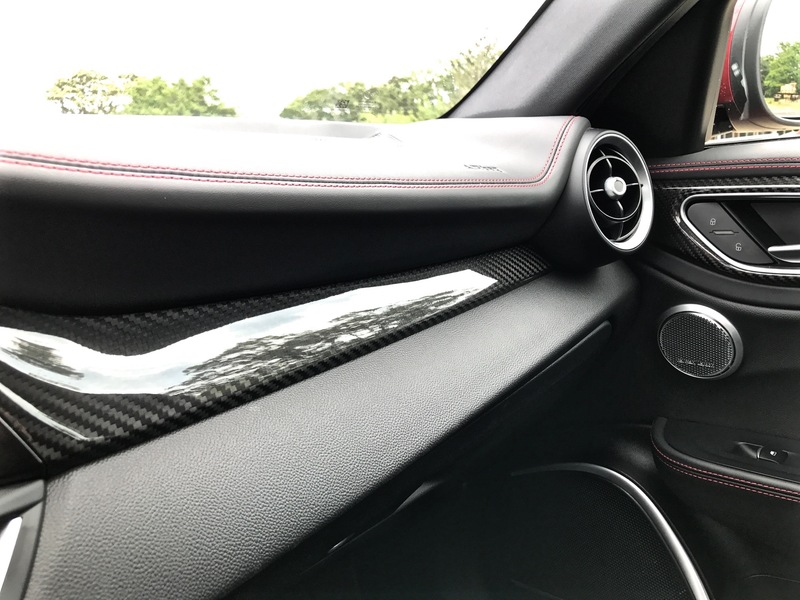 All of the trim is carbon fiber and even the seatbacks are made of the stuff. It’s by far and away the most interesting looking cabin in its class. 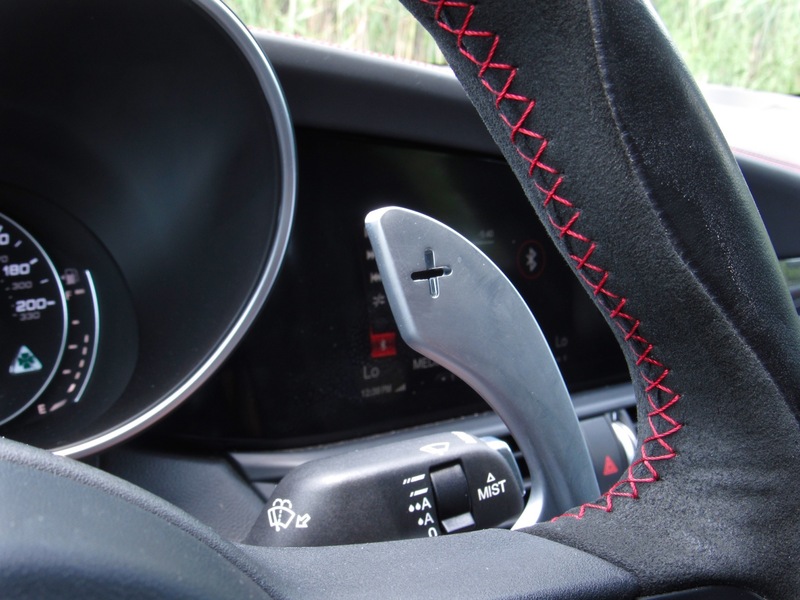 The steering wheel looks as if it could have a Prancing Horse on it and don’t even get me started on the paddles. 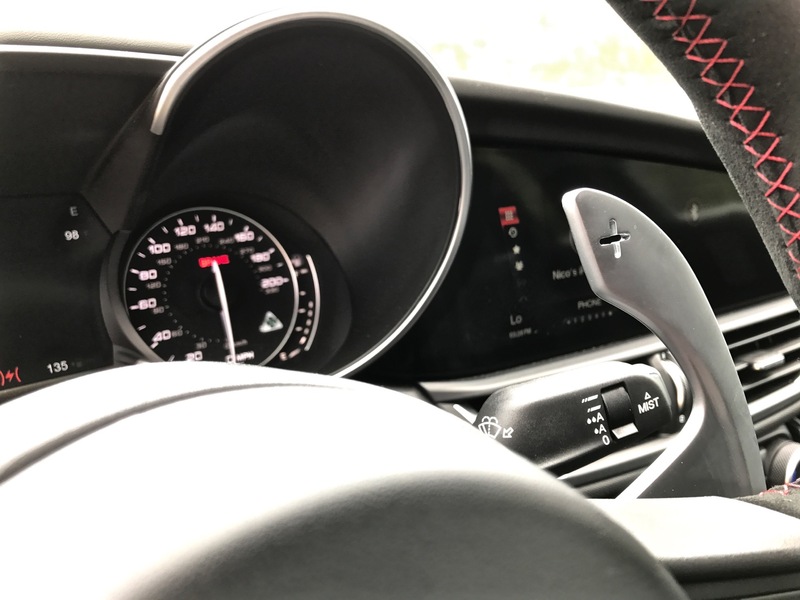 The giant aluminum paddle shifters look like they came straight from Maranello and the tactile feel they have when you pull one is the stuff of mechanical dreams. 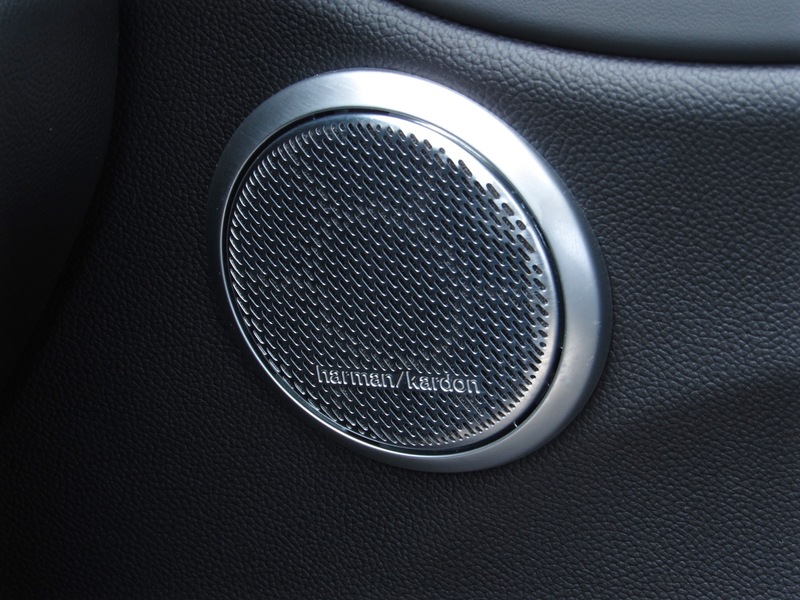 There’s a satisfying metallic “click”, which feels robust, premium and exciting. Though, admittedly, my hero took a bit of a reputation hit once I sat in the seat. While gorgeous, the seats are only comfortable momentarily. After about thirty minutes, my back started to ache and my legs were getting cramped. 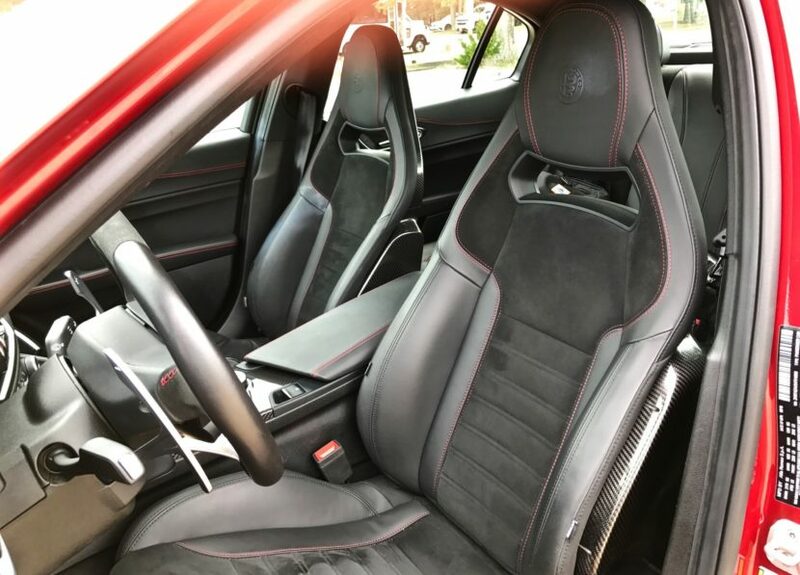 Maybe I’m just getting old but the Alfa’s seats have nothing on the thrones you get in anything with a Roundel or Three-Pointed Star. 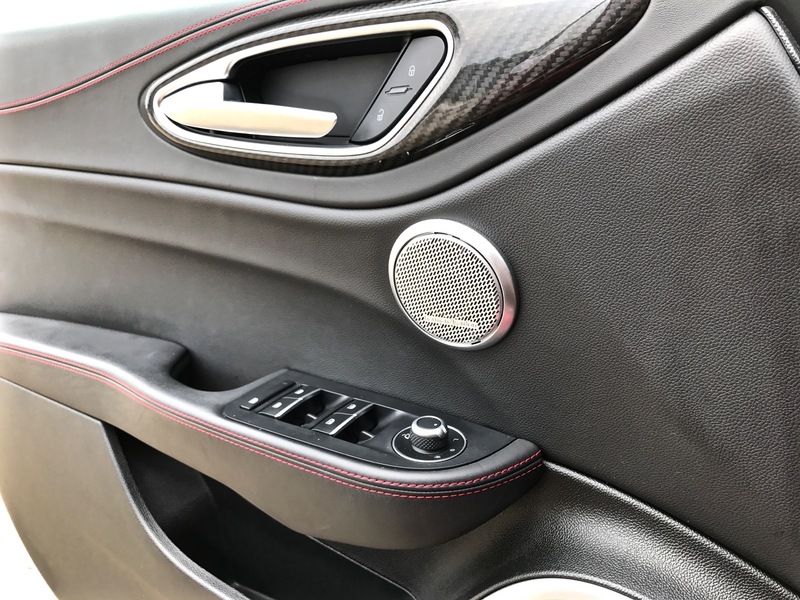 They look great, though, and that’s really all that matters in an Italian car. 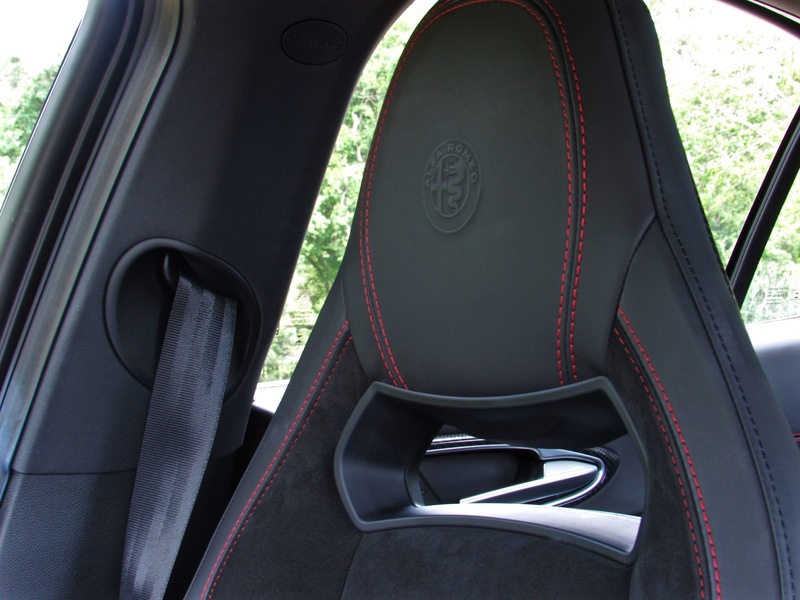 Plus, Alfa did nail the seating position. Nice and low, but with a good view over the scuttle, and all of the controls are exactly where you’d want them. This isn’t your grandfather’s Alfa, where the steering wheel sawed off your testicles (if you happen to have those) and the pedals were actually in the lane next to you. Without trying to sound too cliché, I do have to criticize its interior quality. Yes, this is the part where I point out some very typical Italian car stereotypes. The infotainment wheel felt like it was going to fall off at any given moment, as did the drive mode select wheel. The lever that adjusted the seatback felt like it was outsourced by Fisher Price and the interior hood latch may have been the cheapest feeling automotive control I’ve ever felt. I was actually apprehensive of popping the hood for fear of breaking the handle off. It was that flimsy. Despite all of that, though, there’s something deeply satisfying about being in the Alfa. It’s so different from any car in its class. It’s so wonderfully Italian that I never really cared about some of its interior oddities. All that mattered was that I had an Alfa Romeo symbol on the steering wheel in my hands. 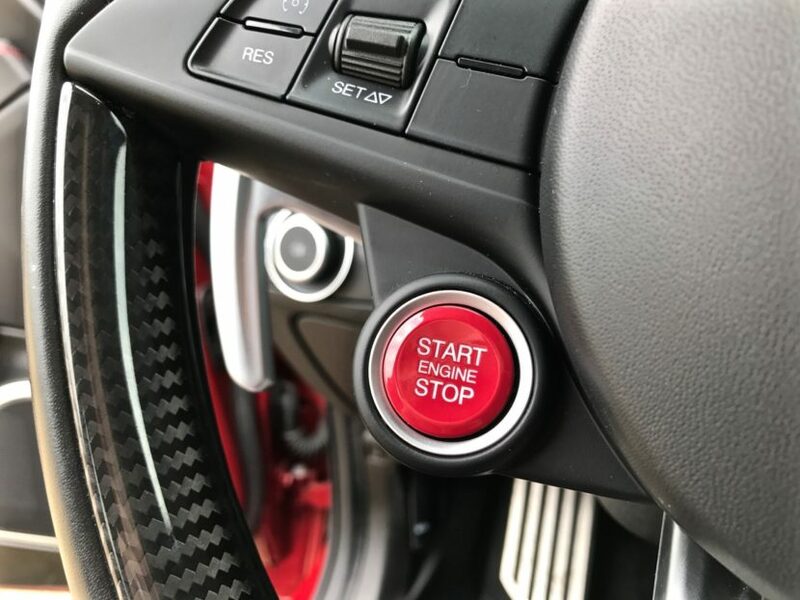 On that pretty steering wheel lies one of the only buttons in the cabin that works wonders — the starter button. Thumb the red starter and that glorious engine sparks to life. Under the hood lies a 2.9 liter twin-turbocharged 90-degree V6, also derived from Ferrari. While the engine isn’t actually a Ferrari California T engine like many claim, it is related, as they share a block and some components. On startup, it makes a lovely little growl and bark, then settles into a quiet burble. It’s an aggressive noise, if not the prettiest of noises. Though, that may just be my high expectations talking. Once I set off for the first time, all of the complaints and worries I had of interior quality and ergonomics were forgiven. 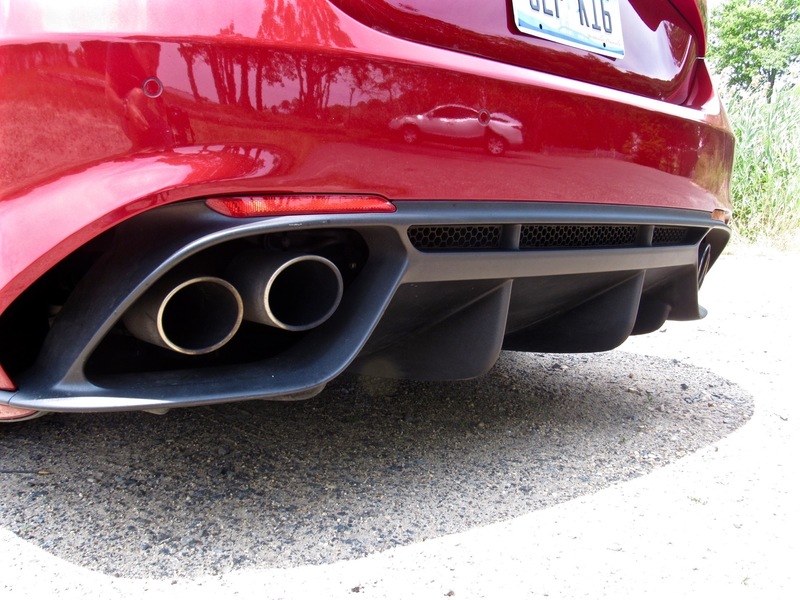 That twin-turbo V6 makes 505 hp and 443 lb-ft of torque, making it significantly more powerful than the BMW M3. In fact, even the absolute hottest BMW M4 GTS is a few ponies shy of the Alfa. 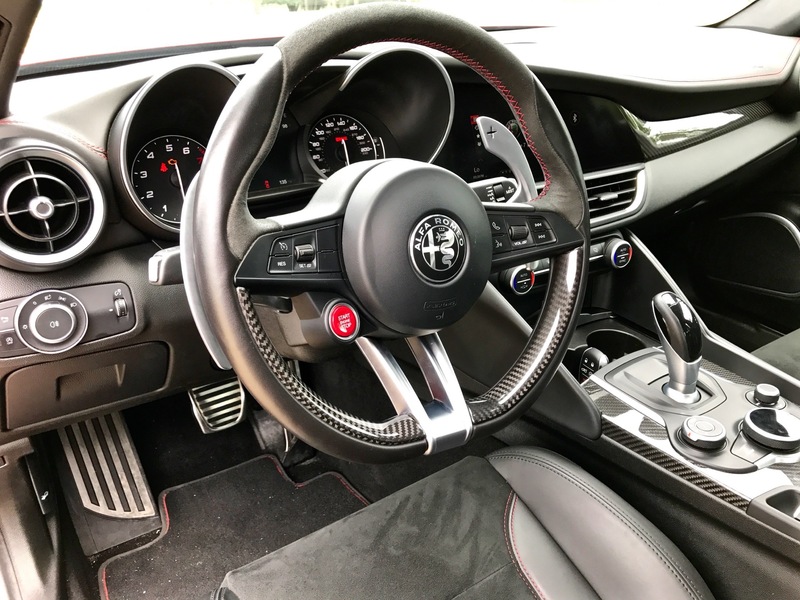 While its competitors get fancy dual-clutch gearboxes, the Alfa pairs its twin-turbo V6 with an eight-speed ZF-sourced automatic. 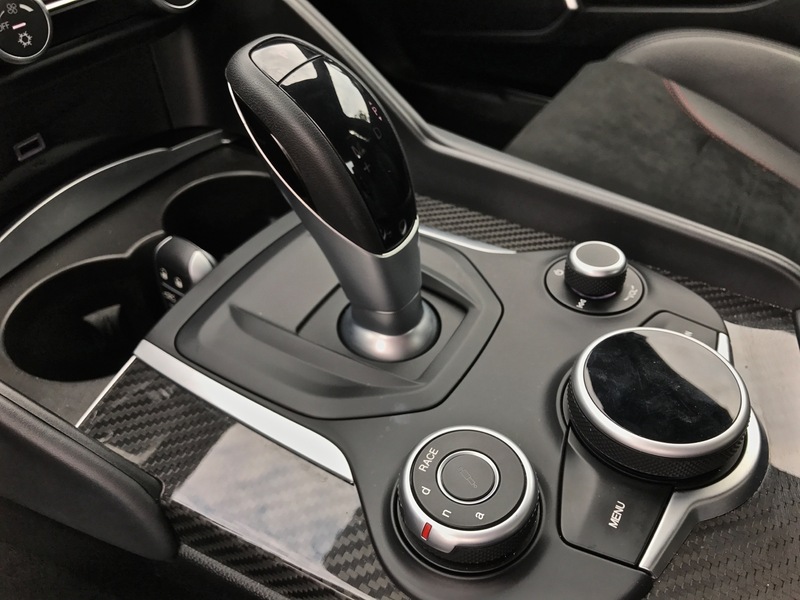 Continental European buyers get a six-speed manual option, but buyers in the UK and US lack the option for three pedals. Though, we’ve heard that its manual isn’t very good to use. So combine that face with the fact that the ZF eight-speed works brilliantly and there’s no malice towards Alfa over the lack of a manual. 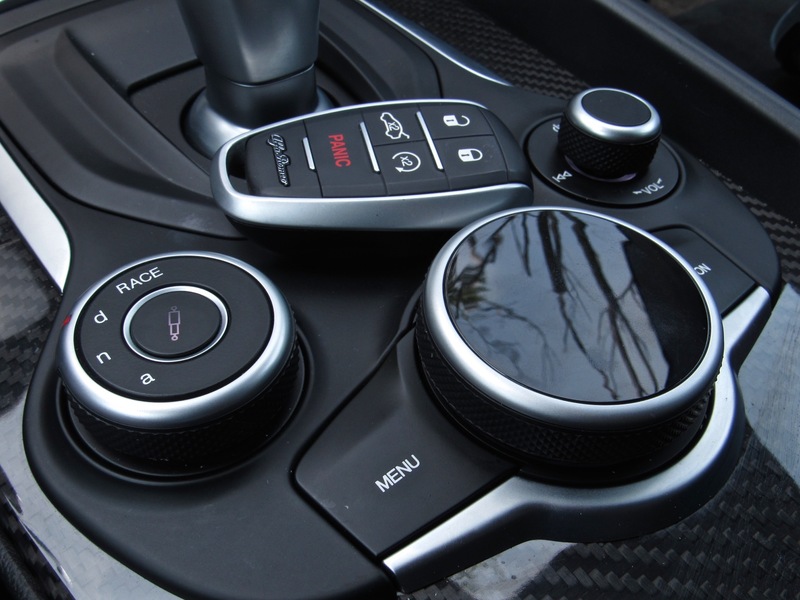 Plus, with the auto ‘box, you get to use those fantastic aluminum paddles. The Giulia also has its own drive select modes, much like the BMW M3, except they aren’t labeled with the typical “Comfort, Sport and Sport+” labels that seemingly every other car in the class has. Instead, the modes are just identified by a “D”, “N” or “A” on a little rotary dial. Clever, right? DNA, get it? Cute. Those letters stand for “Dynamic”, “Natural” and “Advanced Efficiency”, respectively. While that’s a bit confusing, because they aren’t labeled and the car doesn’t tell you what they do, it’s pretty easy to figure out. Dynamic is the sporty mode, Natural is the normal mode and Advanced Efficiency is, well, efficient. The latter of which can even shut down half its cylinders, for better economy. So it’s pretty simple and easy to learn. There’s also a “Race” mode, which requires turning the drive select dial past “D” so far that it feels like it’s going to break. Every time I used race I genuinely thought I would accidentally break the little dial. Also, Race mode switches off every traction and stability control, which can be a bit unnerving in a 505 hp car. Despite being odd, once you learn the drive modes, it’s easy to use and works quite well. It also has possibly the best drive mode button in any car in the segment. In the center of the DNA rotary dial lies a single button with a little coilover pictured on it. 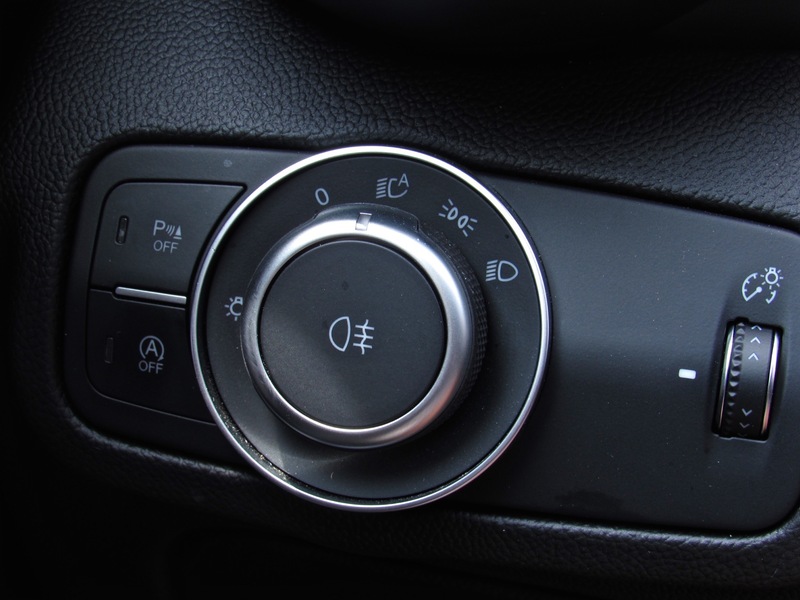 This is the button for the “Soft Damper Mode”, which puts the suspension in a softer setting, even if you’re in Dynamic or Race mode. In Natural or All Weather, the dampers are already in their softest setting. 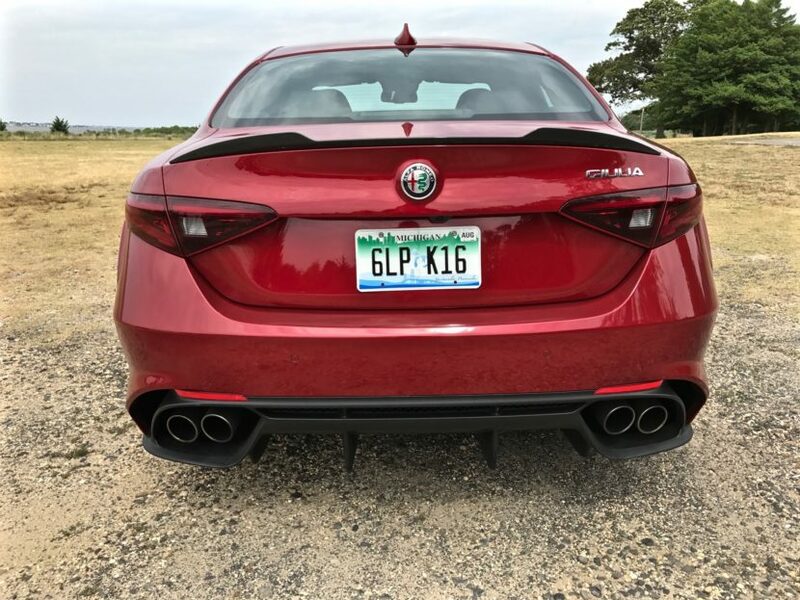 The Giulia Quadrifoglio starts off in its default Natural mode and it became immediately apparent that the Alfa Romeo Giulia Quadrifoglio was a very different animal than I had originally anticipated. I had expected it to be a fire-spitting monster with more of an edge than its German competitors. However, it wasn’t that. Not at all. In fact, at normal speeds, it’s quiet and comfortable. 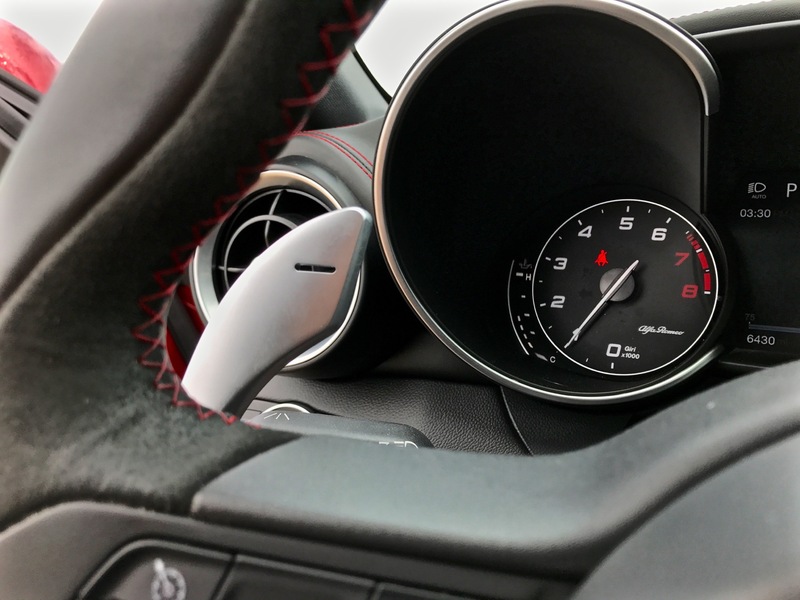 With the windows up, there’s little to distinguish the Quadrifoglio variant from its standard Giulia sibling. That’s no bad thing, though. One of my only complaints about the current-gen BMW M3 is that it doesn’t switch off well. It’s always an monster, straining at the leash, trying to kill you. 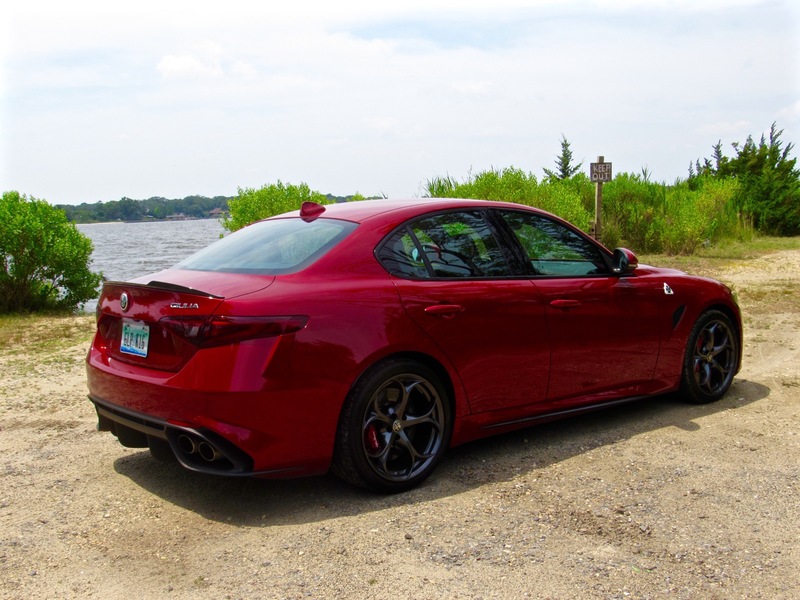 The Alfa can switch off and become a calm, docile and, dare I say, luxurious sedan. Its steering is light but very direct and weights up nicely through corners. It isn’t very communicative but it’s very accurate. While it may not be quite as razor sharp as the BMW M3 Competition Package’s, it’s damn close and makes up for it by being absolutely lovely. It’s a more enjoyable car to toss around than the M3. It’s just wonderful. The ride is superb as well, with a wonderful blend of compliance and control. It rides better than any of its German competitors and sort of reminds me of a previous M3, the E46-generation. It’s quite lovely, actually. Spin that dial to “D”, though and the Italian becomes a different shade of red. The exhaust opens up, the throttle gets sharper, the steering gets some weight and the ride stiffens up. 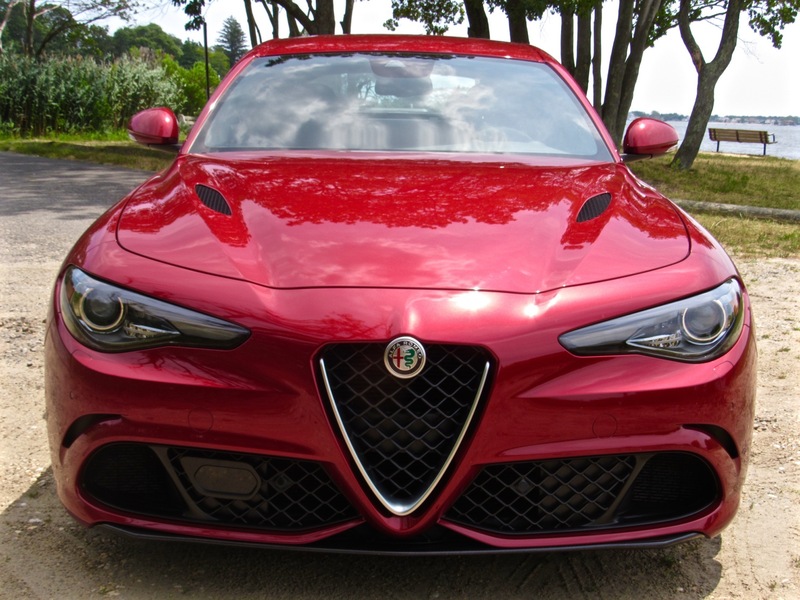 It becomes the Giulia Quadrifoglio I thought it would be. It’s loud, it’s brash and it’s exciting. Oh, and it’s very, very fast. I had tested the BMW M3 Competition Package only days before testing the Alfa, so I didn’t get to compare the two directly. 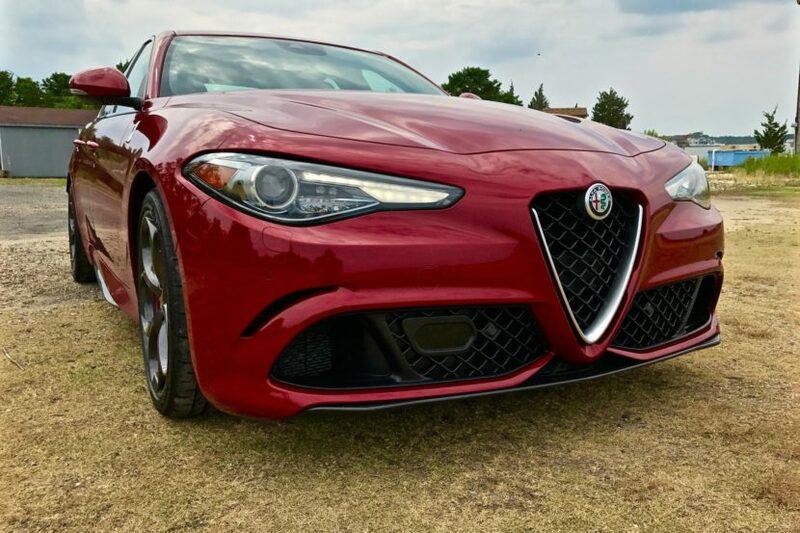 But with just those few days in between, the Alfa feels faster. 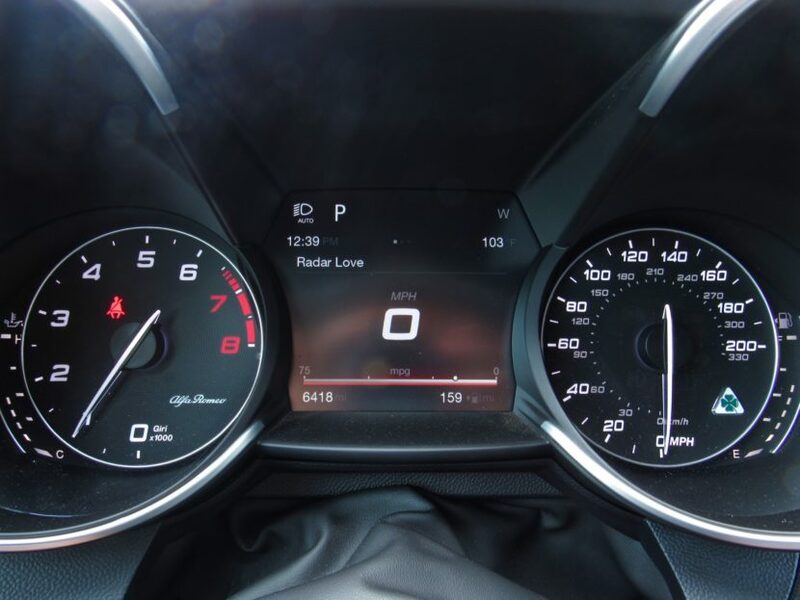 There’s quite a bit of lag under around 2,500 rpm, but once on boost that twin-turbo V6 becomes an absolute monster. The surge is massive but surprisingly smooth. I had assumed that the 90-degree V6 would be coarse and rough compared to BMW’s butter-smooth I6 but it isn’t. It’s creamy and smooth, yet violently powerful. It hurls you forward with impressive ferocity, the growling exhaust rising as the revs do and then you pull the right paddle and get to do it all over again. It’s an intoxicating experience. I’m a big fan of the BMW M3 Competition Package. I had always felt that, despite the C63 AMG being awesome and the Cadillac ATS-V being impressive, the M3 was still the king of being the best all-around performance sedan. 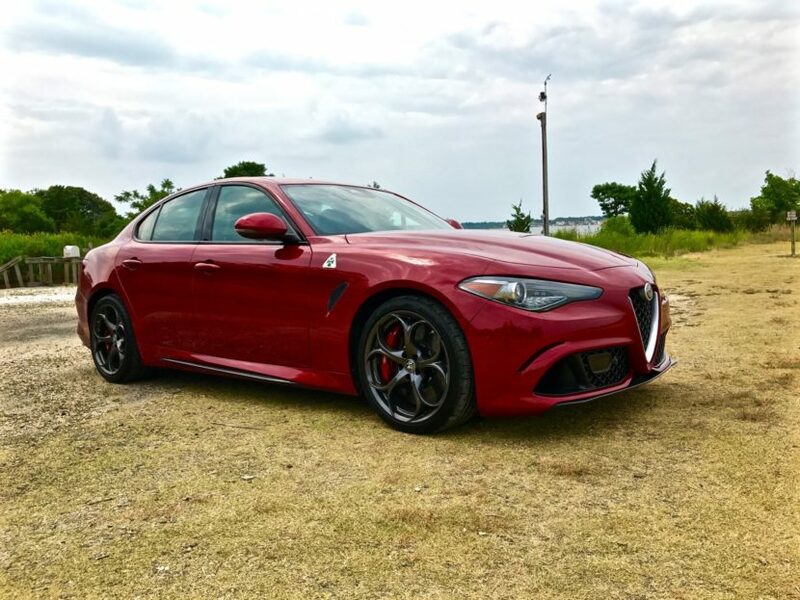 Only the Alfa Romeo Giulia Quadrifoglio has begun to sway my mind. 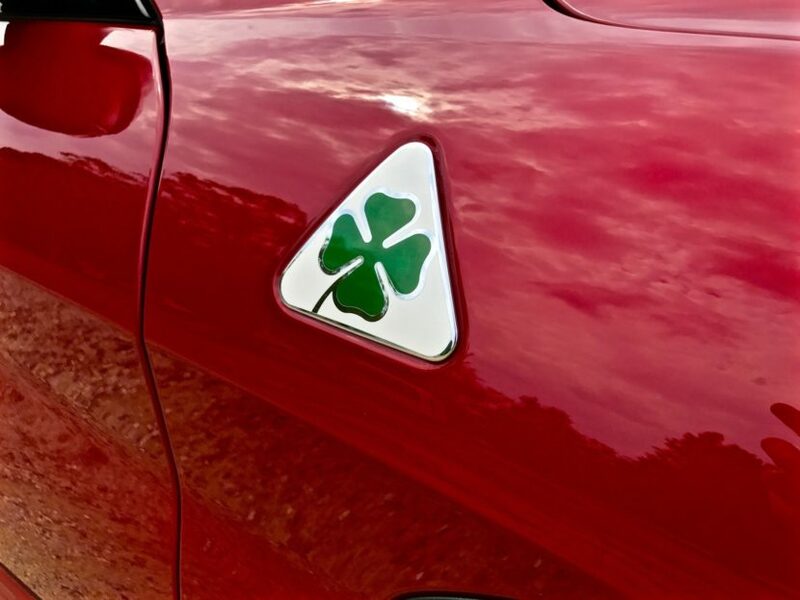 During my time with the Alfa I learned many things about it, both good and bad. It can be quite annoying a lot of the time. 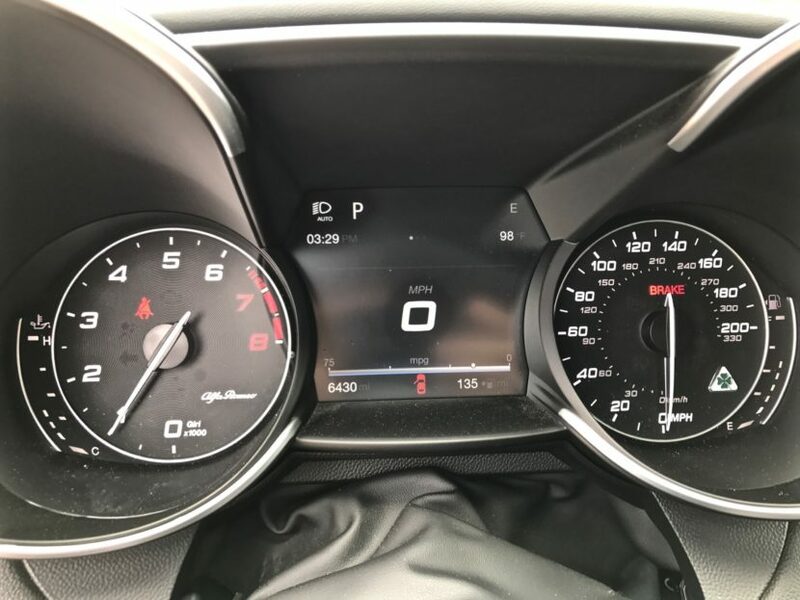 Its infotainment system is maddening, many of the interior bits feel far less than premium and with only a few thousand miles on the clock, my tester already had quite a few squeaks and rattles. Yet I absolutely fell in love with it and though I’m trying really hard to avoid typical auto-journalist trope at the moment, I can’t. 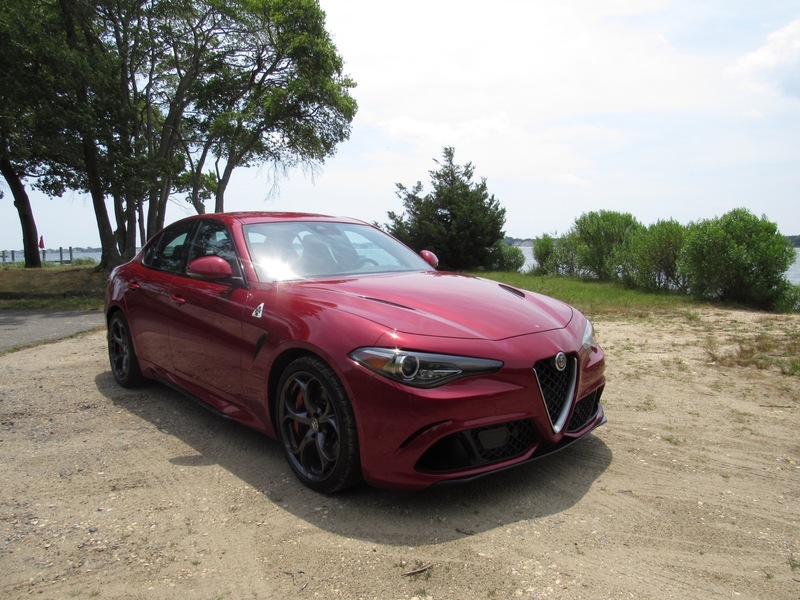 There’s simply nothing with four doors that feels as special as the Giulia Quadrifoglio. It looks like a proper Italian sports car, with voluptuous curves, aggressive lines and carbon fiber everywhere. Its cabin looks like it’s housed inside a proper exotic sports car. There’s something special and exciting about just driving it. Every time I sat inside, it was an event and that can’t always be said about its German competition. Now, the real question, would I buy the Alfa Romeo Giulia Quadrifoglio over the BMW M3 Competition Package? To be completely honest, probably not. Though, the Italian is started to sway me. During my brief time with the Alfa, though it never had any major issues, it just never felt as robust or dependable as the M3. BMW’s tech is also miles ahead of Alfa’s, which makes living with it far easier. Plus, BMW’s dealer network is far better and the M3, even with the Comp Pack, is cheaper. The logical side of my brain would say that the BMW M3 Competition Package is still the way to go. It’s the smarter choice and still has enough performance and excitement to thrill. Yet, the passionate side of my brain would say that the Alfa is worth any minor issues that might arise. It’s that exciting, that thrilling and that special. I’m not so sure which side of my brain would win that argument, if I was ever put in that situation. However, I don’t think it really matters. 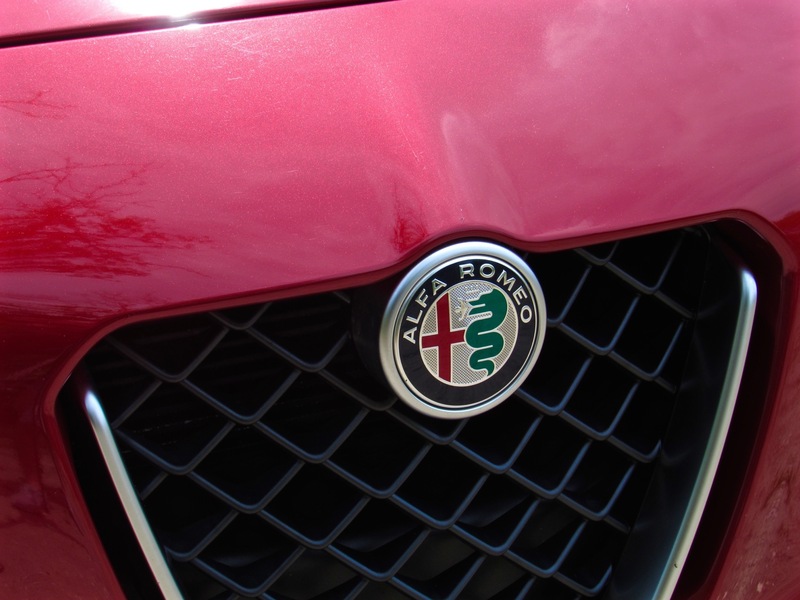 The important part of all of this is that Alfa Romeo is back. 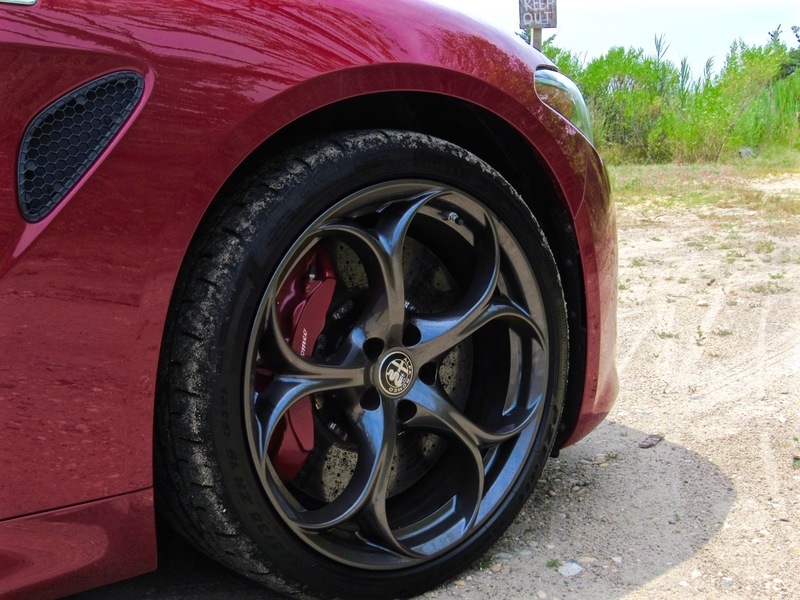 The famous Italian brand has made a genuine rear-wheel drive super sedan and it’s incredible. All of those years, waiting to finally drive my Alfa and I finally did it. The best part about it? It didn’t disappoint. In fact, it was better than I could have ever imagined. 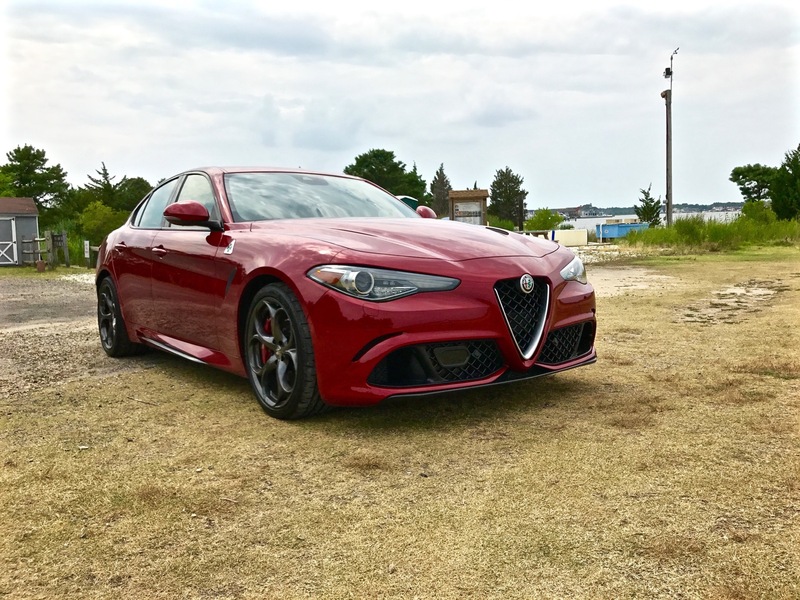 The Alfa Romeo Giulia Quadrifoglio may not be perfect, it may not be as well built as its competitors and its tech may be lacking. 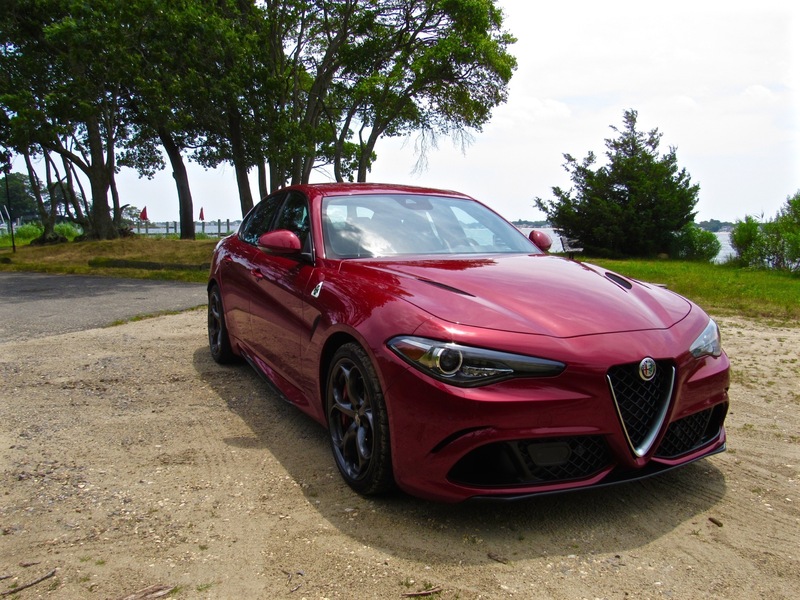 But nothing with four doors brings as much drama, excitement or joy as the Alfa.